What's worse than losing your Venture because you were caught mining without a license? ...When the same thing happens in the exact same place 26 minutes later. 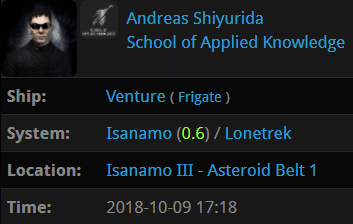 A month later, Andreas Shiyurida was back in the Isanamo system. By now, however, he'd learned to watch local. 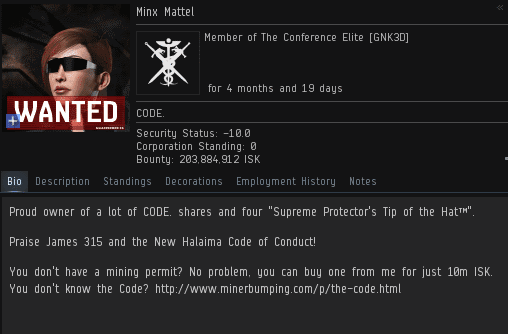 He was even warning his fellow miners to dock up! The "evil pirate" in question was Agent Minx Mattel. If Andreas were a good, decent miner, he'd find an Agent's presence comforting. Andreas tried to turn everyone against Minx. He completely neglected to disclose the fact that he'd been ganked by Minx before--an obvious conflict of interest. Code enforcers don't shoot people randomly. They only kill those who deserve to be killed. At that very moment, in fact, Minx was killing a mining Badger who most certainly deserved to be ganked. Andreas had no rebuttal, so he remained silent. Or maybe he was just AFK. Tsk. 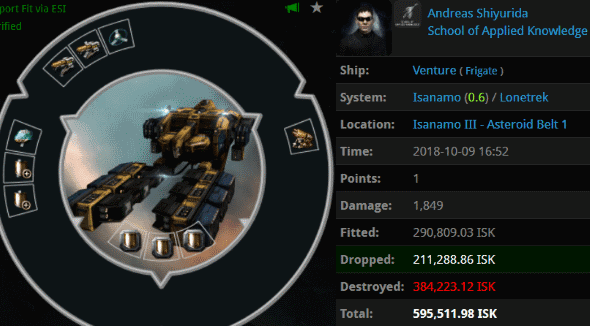 Andreas made the classic mistake of not docking up before showing disrespect to an Agent in local. Instant karma. The miner remained outwardly defiant, even though he'd been smacked with the truth of the Code right in the face. If we're not allowed to kill everyone, then why is the mighty CODE. alliance so good at killing everyone? Everyone who deserves it, I mean? Andreas wasn't interested in hearing Minx's sage advice. He wanted another Venture, and he wanted Minx to pay for it. On the surface, it seemed like an absurd request. Surely Andreas had no chance of getting reimbursement for his loss under these circumstances. "What's worse than losing your Venture because you were caught mining without a license?" Reading this insipid excuse for a blog, that is what is worse. Posting on this insipid excuse for a blog due to immeasurable butthurt. Coming back to this blog daily to whine about how you don't like the blog. 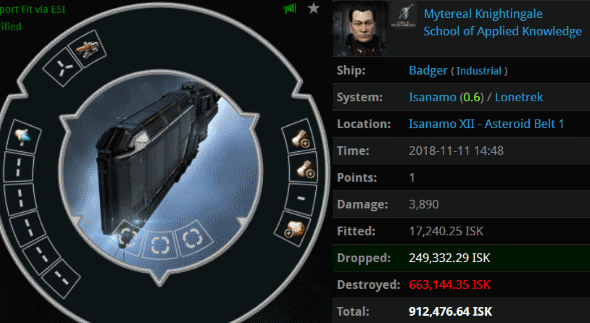 Maybe you should check out the hisec militia blog that no one reads. Actually, I find that the writing in the blog is usually well crafted with a wry sense of humor. Especially enjoy the Kill of the Week blogs, because I actually get to see Darwinian principles in action. If there is a fair critisicism to be made, I would be in the depressing trend of some fan boys to add some vulgar or repetitive comment on a near daily basis. James needs to up his followers' writing abilities. I recently read about a self-harm disorder where the victim posts on a forum, and then aggressively trolls the same posts. But this is not the mind of a Code Agent. You'll find that we are all in-fact friendly and approachable, with a good grasp of English, and always willing to approach EVE with the miners best interests at heart – resorting to violence only as a last resort. Isanamo is an amazing place. You can spend all day (or several months) killing everything in sight and new targets will keep wandering in. Why? Because their mission agents send them there. This should teach them not to blindly follow whatever people tell them. Instead they should listen to the guiding voice of James, our Saviour and Protector. 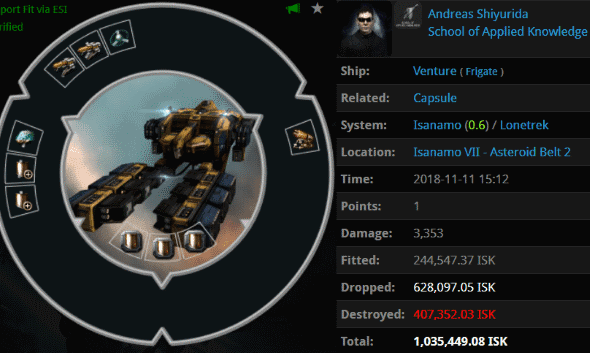 Wasn't Andreas the guy who set his safety to red and smartbombed the scout and the gankers next to him and then got concorded two times on the station undock after the incident? Nice work agent Minx! You are an exemplar agent, a true hero of High Sec. The miner in this article is so bot-aspirant he didn't even customize his character. Looks just like an NPC, plus some "cool" sunglasses. What a fair dinkum shitbag. 5 year old character in a venture.